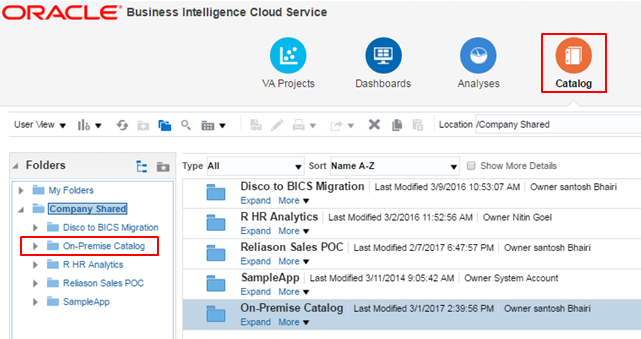 The objective of this article is to guide you through the detailed process involved with migration of on-premise OBIA with different analytics applications (Finance, SCM, HR, Procurement and Spend, Manufacturing Analytics and Custom Subject Areas) to cloud-based Oracle Business Intelligence Cloud Service (BICS). Oracle BICS is one of the latest cloud offering from Oracle with a proven platform for creating powerful business intelligence applications, enabling users from the workgroup to the enterprise. So the above barriers (there are many more under the hood!) 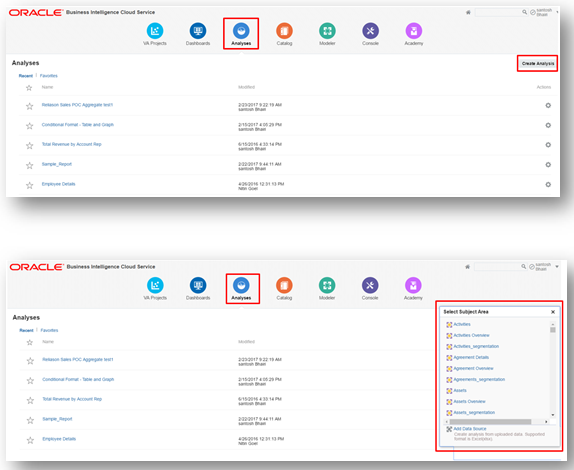 can be easily achieved by moving your Oracle BI-Apps content to Oracle BICS. NOTE: This document is written based on Oracle BICS current version 17.1.4.0.0. Some of the screenshots may look different in future releases. Since Oracle’s acquisition of Siebel Analytics in the year 2005, there are multiple major versions of OBIEE have been released. As an existing customer one could still have any of these previous versions, though many of them are out of support already. 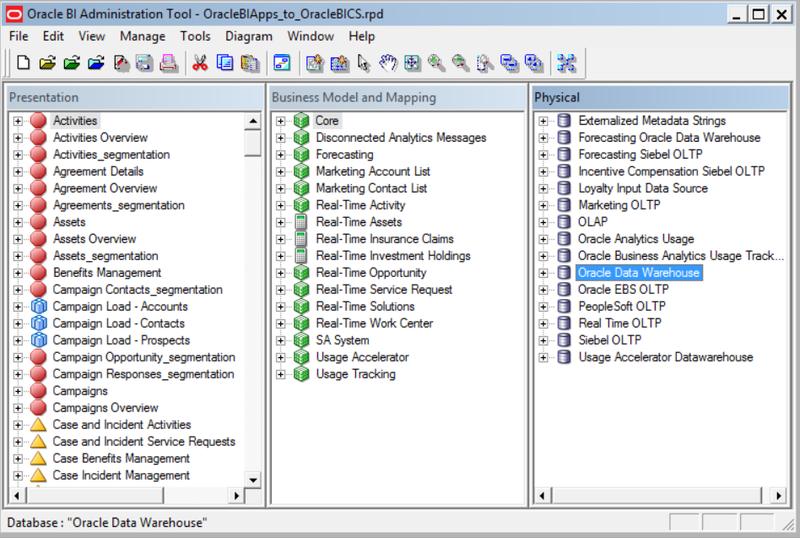 If you are on OBIEE 11g and thinking to move to latest tech-stack OBIEE 12c, check this detailed document. a. Take a snapshot of your BICS environment (in case of any issues during migration and to restore at a later date) using console as shown below and set a password as well. 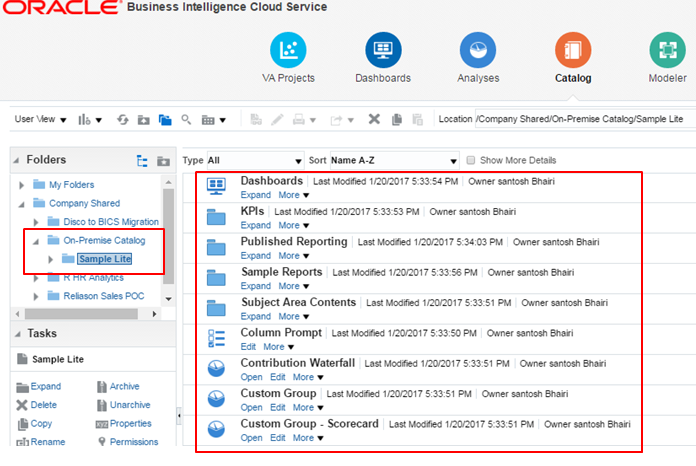 Let’s look at the process involved in moving Oracle BI-Apps content (Finance, SCM, HR, Procurement and Spend, Manufacturing Analytics, etc.) into Oracle BICS. 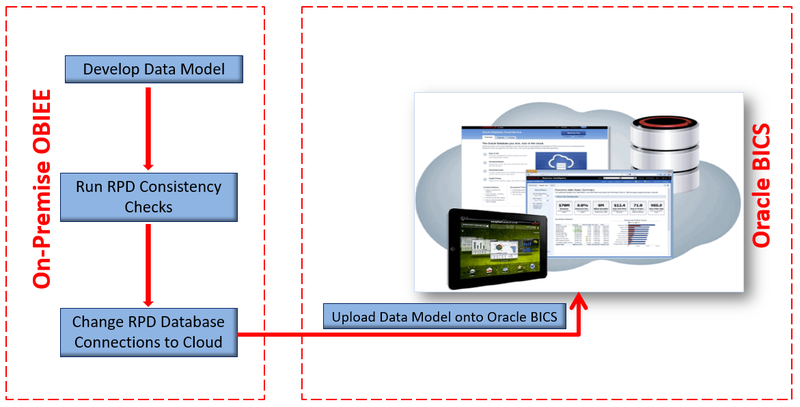 First, let’s look at the process involved in migration of Oracle BI-Apps RPD/Data Model and Catalog to Oracle BICS. We will be covering the other two parts separately. 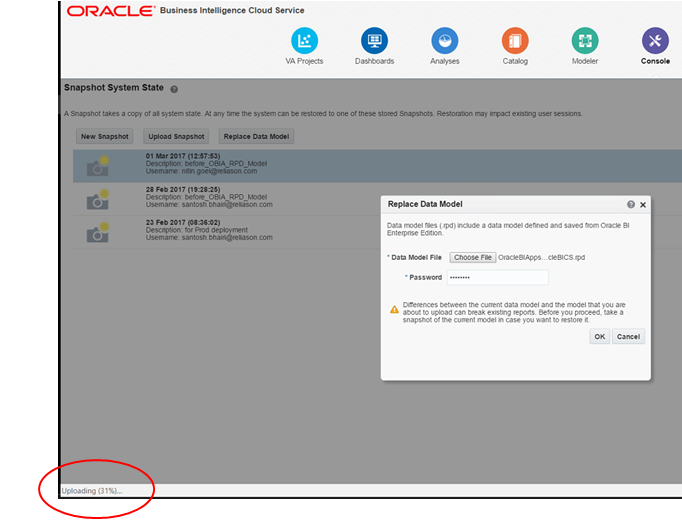 As shown in the below diagram, develop your data model using on-premise BI Administration Tool, make sure to run global consistency check to avoid any type of errors (warnings are fine) then change the physical connections to point to your on-premise database or Oracle DB Cloud Service. Please note during RPD lift and shift process, you cannot connect to BICS own database. 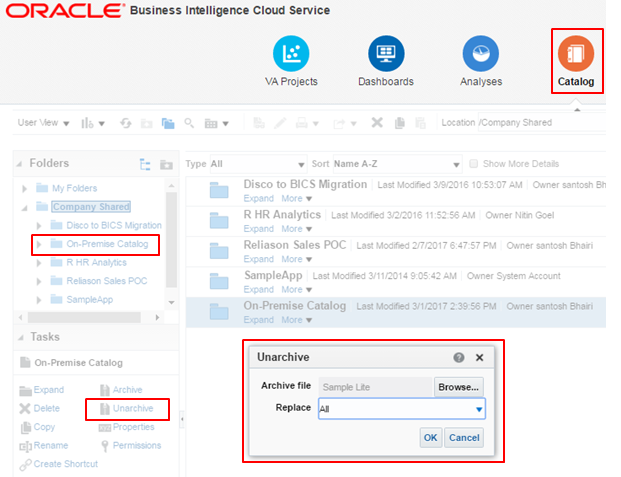 Once these are done, upload the data model (.rpd file) onto Oracle BICS using Console and Replace Data Model. If you already have up and running on-premise OBIEE instance, there is no need to develop a separate data model instead you can use the same data model/rpd file. If not, you may have to develop a thorough and working data model. It is recommended practice to run a global consistency check after every change in data model/rpd to avoid any potential inconsistencies which leads to issues in starting the services or report errors. Typically, any warnings can be ignored as they arise out the best-practices but they can be fixed as well so your RPD will be in a good state. 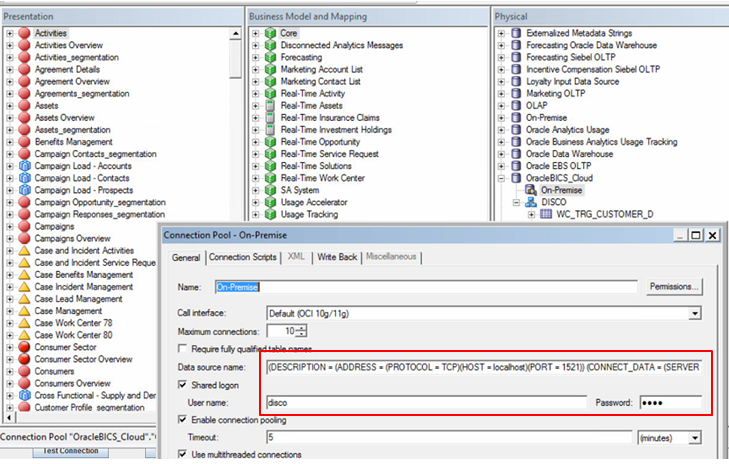 Obtain necessary Database Cloud Service hostname, username and password for updating respective RPD physical connection pools as your on-premise RPD physical connections will be pointed to on-premise database. Before proceeding further, please make sure the snapshot is created as mentioned above under Pre-requisites. 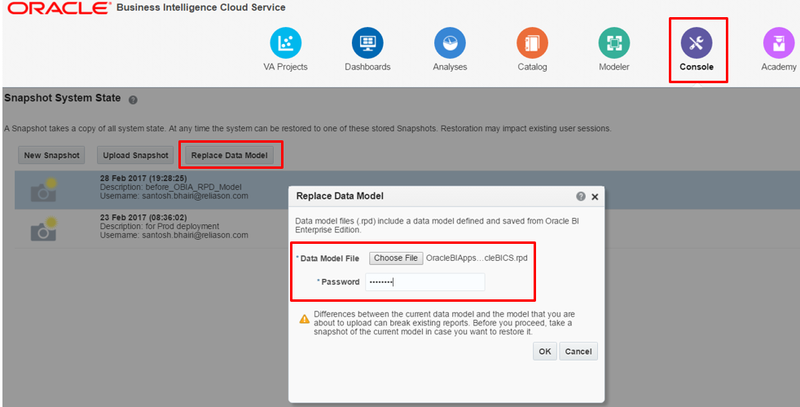 Login to Oracle BICS environment and click on Console and then on Snapshots and Models. Click on Replace Data Model and choose on-premise rpd/data model and provide the password which is your rpd default password. Depending on the size of the data model (and connectivity), it takes couple of minutes to load it and you can check also the status of completion in the task bar of the window. If there no errors during upload process, you will a success message with your data model name on the top of Console screen. Check if you need to replace any folders as your on-premise webcat might have something like ‘/shared’ and your BICS with ‘company_shared’. 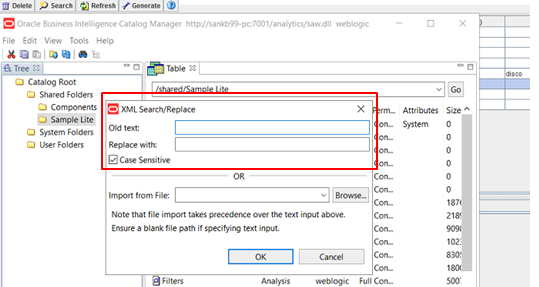 This can be done with a simple XML Search/Replace option using on-premise BI Catalog Manager. Archive catalog and move to a temporary location. Choose options relevant options for timestamps and permissions whether to carry-forward them or not. Now, logon to Oracle BICS and then click on Catalog to Un-archive the catalog objects. It would be good to create a separate folder just to avoid any conflicts with existing catalog folders and objects. Select the newly created folder and click on Unarchive to select archived file and select a relevant option under Replace. If you already have OBIEE 12c on on-premise, it is easy to get a snapshot or .bar file for Application Roles. The .bar file can be directly imported into Oracle BICS using Console and Upload Snapshot options. If not, they need to be created manually. We will be extensively talking about these steps in our next series on ‘Enabling Security’. At the moment, some of the features of Oracle BI-Apps are not supported in Oracle BICS environment. For such list, you may like to check Section # 5 of Oracle’s documentation for more information. With regard to enhancements, there are none at the moment but looking at Oracle’s cloud-first strategy, one can expect a bunch of enhancements in the whole migration process, data loading and data security/governance. Migration of Application Roles asks for a password in BICS while I tries to upload the BAR file. As mentioned in this article, is ‘Enabling Security’ created as next series? If yes please share the link. Long way to go santosh!. a very useful article.